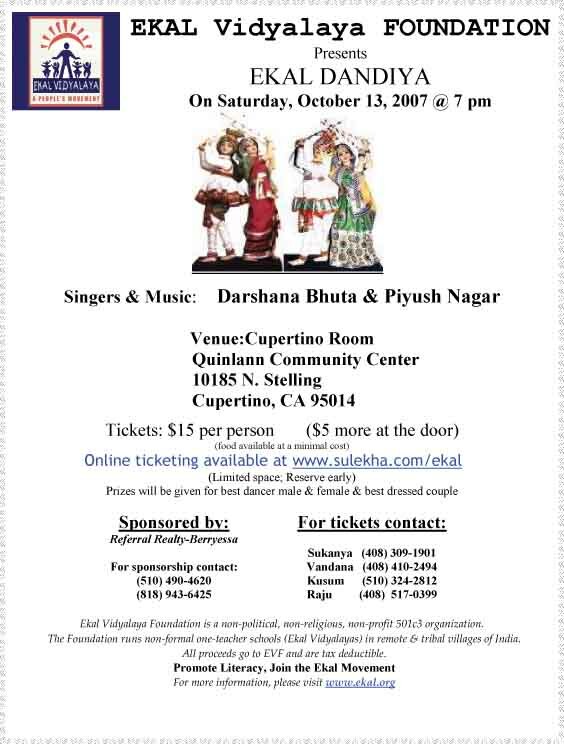 In the series of Annual Ekal Concert 2007, Washington DC chapter of Ekal Vidyalaya Foundation USA, has celebrated it on August 4th 2007. This series aims to present a healthy entertainment through arts and music simultaneously a resource of fund raising activity of a chapter/region. Fundraising events are a way to seek generous contributions for one-teacher schools so that the benefit of education can be brought to the doorsteps of each child living in tribal and rural India. Indeed the world is fast becoming a family since Arch's young artist from Thailand, Taiwan, Spain, South Korea, South America, Germany and India have been traveling across USA as a group for months to stage "The Path to Peace" so that an Indian child can read and write. It is my hope that the Indian community in USA would extend its full support to the artist, value the subtlety, dedication and discipline of their art while sending their own contributions to Ekal in 2007. Kedar Mulpuri a 16-year-old student was specially selected as the master of ceremony for this event. 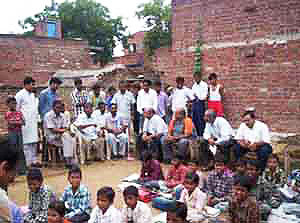 Glaring fact remains that the society and the parents of a 16 year old in this country provide the best opportunity to inculcate the love for education in Kedar, where as parents and their children in a tribal and rural village desperately long for a fraction of such an opportunity to arise in their village in the form of a school. If we as parents can appreciate this disparity then giving becomes natural and working for a noble cause is an effortless duty. Kedar is a rising senior at Lake Braddock Secondary School in Virginia. He is passionate about academics with A+. At school he has started the Medical Interest Club, which discusses current medical topics. He is also involved in Model UN and it's Academic clubs. He frequently enters into science fairs and other science competitions. His connection to Ekal Vidyalaya began almost a year ago when he began tutoring children in a variety of subjects at his home. 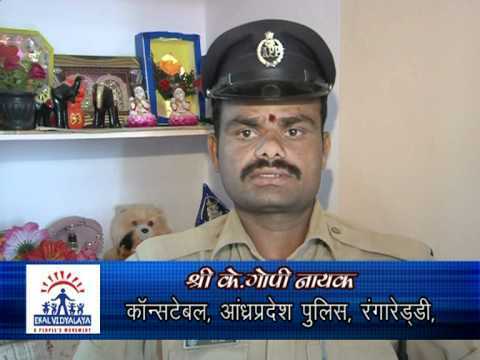 He donates the entire tuition money to Ekal Foundation. He has 5 students with more joining soon. Kedar is receiving support and giving support at the same time. His extraordinary talent is serving the need for education in India. At the August fundraising Rev. Mansfield "Kasey" Kaseman was our guest who spoke on behalf of founder and chairman Sri Raj Shah of Capital Technology Information Services (CTIS) in Rockville, Maryland. Rev. has served as a pastor of community ministries giving voice to conscience and serving human need in Boston, MA, New Haven, CT, Tallahassee, and Fl and for 26 years in Rockville, MD. Kasey is currently chief community services advisor at CTIS. A significant event in Kasey's life was when he was trained in Gandhi's non-violence to provide security for Martin Luther King, Jr. It is with gratitude for the fond memories and commitment to the vision of Ekal Vidyalaya that he spoke on August 4th. Rev and Smt.s. Kaseman also provided funds for Ekal School. "The drawing out the best in child's body, mind and spirit." "This very poor country of mine is ill able to sustain such an expensive method of education. Our state would revive the old village schoolmaster and dot every village with a school both for boys and girls. "(Mahatma Gandhi at Chatham House, London, October 20, 1931)"
An education which does not teach us to discriminate between good and bad, to assimilate the one and eschew the other, is a misnomer." The real difficulty is that people have no idea of what education truly is. We assess the value of education in the same manner as we assess the value of land or of shares in the stock-exchange market. We want to provide only such education as would enable the student to earn more. We hardly give any thought to the improvement of the character of the educated. The girls, we say, do not have to earn; so why should they be educated? As long as such ideas persist there is no hope of our ever knowing the true value of education. 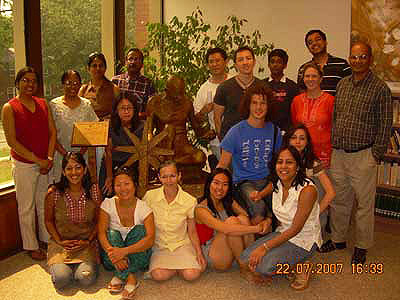 (M. K. Gandhi True Education on the NCTE site). 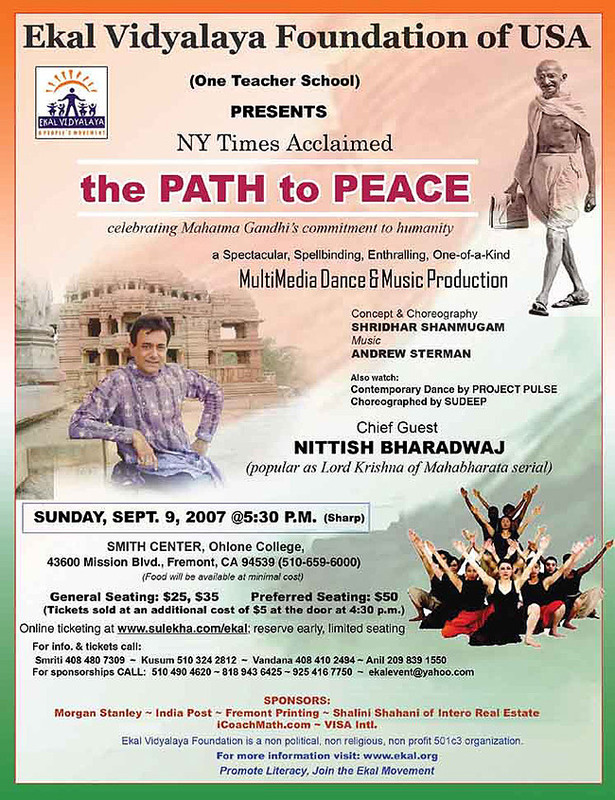 The "ARCH" artist used light, sound, dance forms and multi-media to communicate with the audience the concepts of truth, faith, fearlessness, ahimsa, satyagraha and freedom and democracy. The concept and choreography was by Sri Sridhar Shanmugam, Executive Director of Arch Worldwide. Sridhar has been both an international ambassador and a pilgrim for the arts. He was trained in the most prestigious school of dance from Tamil Nadu – India and later started working with Chandrasekhar, the legendary Dancer in 1983. Andrew Sherman provided music for the event. His music has attracted praise from New York (NYTimes: "beautiful and sensitive playing") to Paris (Liberation: "Fabulous") and Australia (The Age: "a sound as pure as moonlight"). 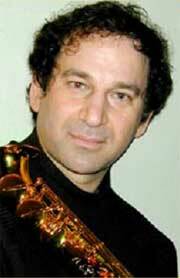 In addition to presenting his original ensembles, he has performed with a huge variety of major artists from Frank Sinatra, Freddie Hubbard, Dizzy Gillespie, Sarah Vaughan, Aretha Franklin, to New York's premier new music ensembles, ISCM, EOS Orchestra, Bang On A Can, MATA, and of course is well known for his work in the Philip Glass Ensemble. Sterman's concept of music is wholly new concept. This year Washington DC had two fundraising events. First event was on June 16th at the India center in Charleston West Virginia and the second at the F. Scott Fitzgerald Theatre 603 Edmonston Drive Rockville, Maryland 20851 on August 4th 2007. Both events were great success in all respects, particularly in terms of attendance and performance. About 150 people attended the Path to peace in West Virginia. About half were non Indo- American. This was very large audience given the relatively small size of the Indo American community in Charleston and represents good progress for broadening the support base for the Ekal Vidyalya program. The performance was exceptional and was appreciated by the entire audience. The quality of the choreography, dancing and music was excellent. There was pin drop silence during the performance and the artists received an extended standing ovation. This was the first presentation of contemporary Indian dance in West Virginia and Maryland. Sridhar Shanmugam and his group were amazing. Despite a long journey, short resting period cut even shorter by flat tire, the Arch group presented a wonderful exciting performance full of energy at West Virginia. Organizers from West Virginia and Washington DC Chapters are deeply appreciative of Arch's devotion to the cause of Ekal Vidyalaya. We extend our gratitude and best wishes to "The Arch" and it's artist. Ekal DC youth and other volunteers worked tirelessly to make this event a success. Dr. Shanker Gupta coordinated the event. 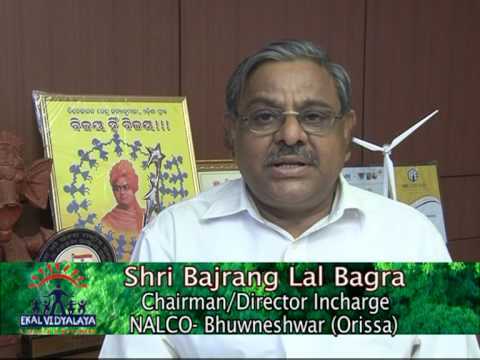 Special thanks are due to Sri Rameshwar Paul who prepared the brochure for the event, Dr. R.S. Dwivedi welcomed the audience, Dr. Sudhir Sekhsaria presented Ekal Power Point presentation and Dr. Rajiv Kumar gave vote of thanks. Following organizations were recognized as Friends and Supporters of Ekal in the August 4th brochure: Art of Living Foundation, Chinmaya Mission, DESI (U of MD), Durga Temple, Hindu Temple of Metropolitan Washington, India House of Worship, India School, Indian Medical Physicians Association, Jain Society of Metro DC Area, Marg Foundation, Natya Bharati, Rajasthali Association, Sri Mangal Mandir, Sri Siva Vishnu Temple, Tamil Association, Telgu Association of NA, TIE-DC, and Vedanta Center of Greater Washington. Ekal DC has launched an initiative to involve local organizations for supporting the noble cause of education. 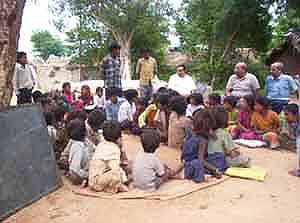 We request all the organizations to join hands with Ekal in irridicating illiteracy from tribal and rural India. The issues discussed were - (1) Dhyeya Chintan (Objective Contemplation) (2) Chapter Working (3) Artha Vyavastha (Financial Management) (4) Artha Vyavahar (Fund Disbursement) (5) Donor Relation Working (6) Karyakarta Relation Working and (7) Others. 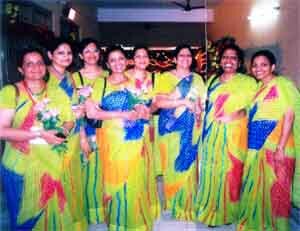 An All India FTS Ladies Meeting was held at Ranchi on August 4th & 5th, 2007. A total of 165 ladies participated in the meet. They had come from 26 cities of 12 states. The meet was inaugurated with a tribal dance programme by tribal children of Dandi School of Gola Sanch of Jharkhand and the eloquent speech by Sri Shyamji Gupta. This meet has been one of the best organized Mahila meets. Among some highlights were the panel discussion, in which some prominent ladies spoke brilliantly about service to nation as an essential part of their life and it helps not bothers to their family lives. Smt Manjushree did well as a moderator in one of the sessions to channel the topic in right direction. Smt. Sangeeta Gupta, the Ekal Global Coordinator appealed to all participants for the best performance of Ekal Ladies Wing of India to play a greater role in Ekal Movement. Dr. Veena jaju, Delhi spoke very well about Arogya Yojna. This meeting was focused on a circumspection of ladies workings at different levels. They mulled over the Seva Patra working in the country and they felt the ladies wing should concentrate on this fundraising activity to enrich our movement. They also had an exchange of ideas about Arogya Working, and they felt that the ladies wing at Anchal level needs to be more active to help Arogya Sevikas workings. Sushree Sudha Santuka’s arduous efforts brought good results. Presence of some eminent ladies like Prof. Veena Sanodhya from Udaipur, Dr. Rajni Gupta of Jabalpur, Dr. Swati of Belgaon, Dr. K Nigam from Bhopal was significant. Smt. A good number of ladies came for the first time, who assured that they will give many more ideas, views and suggestions to make ladies workings more effective. The Chief Guest of the programme - an IAS officer Smt. Smitha spoke very well and expressed desire to join the Ekal Movement. Smt. Pushpa Mundra and Smt. Sheela Chitlangia contributed significantly in the varga by their suggestions. It was amazing to see a beautiful interaction between domesticated and professional ladies, all of them interacted marvelously with each other as if they were all from one big family only. It was a great occasion for Ranchi Mahila Samity to show their potentiality. Smt. Usha Jalan, Smt. Manju Gupta, Smt. Sunita Mehensaria, Smt. Kanta Budhia, Smt. Raj Jain and their team members of Ranchi Mahila Samity made this Varga memorable. These five ladies have taken the responsibilities of improving the functioning of Ekal Programmes on a wider basis, which is a great feat for ladies to handle in any chapter. Ranchi ladies have volunteered with courage and conviction to do this difficult work. No doubt the Ranchi Chapter has been benefited greatly by this very successful event. Pradeep Mehato, an ekal child stunned the audience by his miracle memory when he stood on the stage and told the names of the district & blocks of Jharkhand state, names of the states of India and of continents of the world without stopping or faltering for a moment. On the auspicious occasion of Lord Krishna birth day - Gopashtami, Ekal Vidyalaya Foundation has decided to distribute 5000 cows to 5000 Ekal full time workers of Village Development Movement soon. Those cows will be offered at different national chapters viz. - Delhi, Mumbai, Kolkata and Bangalore. The Annual National Meeting of Ekal Vidyalaya Foundation of USA, is to be held at a beautiful Resort Location in Orlando, Florida. A team of 15 persons of EVF India are expected to participate in this convention, as mentioned below:. 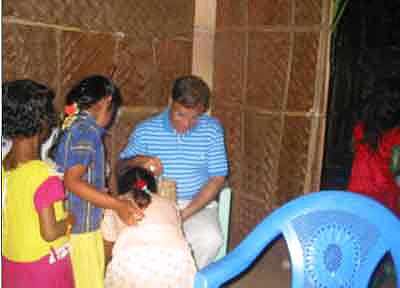 The Meeting will be held on September 21, 22 and 23, 2007. Ekal volunteers are encouraged to join. If you would like to attend or want to know more please contact to Sri Ramesh Shah at his email id - ramesh@ekalvidya.org or his phone numbers - 281-933-6169 (Residence) & 281-300-7424 (Cell). To facilitate active participation of Great Industrialists in resource development activity, EVF has planned to set up a group of NRI Diamond Merchants world wide, which will be led by Sri Jitubhai Bhansali. He will be visiting USA along with some Active Supporters of EVFI in the month of September 2007. On 17th September 2007 a meeting of the Group of Diamond Merchants of USA is to be held in New York. 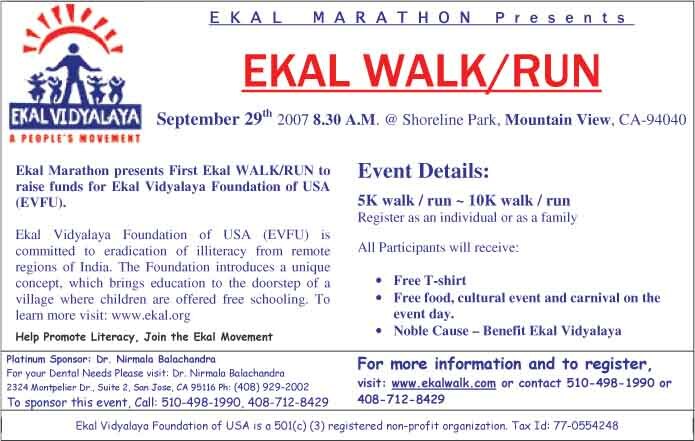 For North California Ekal Marathon write to Reena Rao at her email id - reenarao@pacbell.net cc to ncalrvp@ekalvidya.org or call at (510) 490-4620. 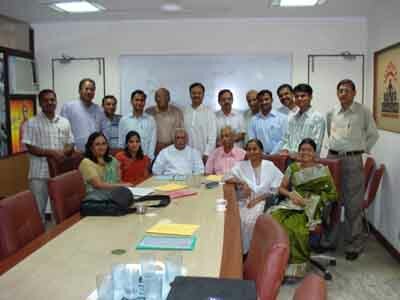 Sri Ashokji visited Coimbatore to take part in the inauguration ceremony of FTS chapter of Coimbatore on July 15 – 2007. On his request the karyakarthas of Ooty Anchal (Supported by FTS Coimbatore) took him on a vanayatra to NANDAVANAPUDUR. This is a Tribal village 60 km., away from Coimbatore on the way to Ooty. This comes under Kallar Sanch of Ooty Anchal. 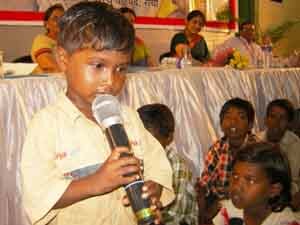 He interacted with the children acharya and the Grama Samithi. After vanayatra Sri Ashokji traveled to Ooty. On 16th the team lead by Sri Ashokji met His Holiness Ramu Baba at the Abubabaji Charitable mission trust in Ooty. Sri Ramu Baba is a Diamond merchant from Mumbai now leading this holy institution in Ooty. Smt. Jyotsnaben Kilachand took us to the Baba. Sri Ramu Babu was very happy to learn about the activities of Ekal Movement and assured all his blessings in all the possible ways. Also Baba gave permission to conduct regular training camps of Ekal Movement in his campus. During his visit to the Tribal village Sri Ashokji insisted that we should do something to stop people of that village from alcohol drinking. Based on his wish on 08th August Swami Sankara Chaithanya from MATA AMRITANANDAMAYI ASHRAM was taken to NANDAVANAPUDUR village as a part of SANT PRAVAS YOJANA (Swamiji himself is an Ayurveda Doctor with MD). He spoke to them about the need for stopping alcoholism. In coming days Ooty Anchal will be organizing such programs including de-addiction camps in all the Ekal Villages. “Here I would like to add that Dr C. Satheeshkumar, Smt. Hemaji, and Sri Ganeshji took good care of me and made wonderful arrangements for the vanayatra to NANDAVANAPUDUR. The team of Dr. Satheeshkumar is committed and renderings their all efforts to stop alcoholism in Ooty Anchal. After the vanaytra we all went to Abubabaji Charitable Mission Trust. We met Smt. Jyotsnaben N. Kilachand, who introduced us to H.H. RAMUBABAJI, after hearing the activities of FTS Babaji has permitted the Ooty Anchal to conduct training camps in the campus of the mission. 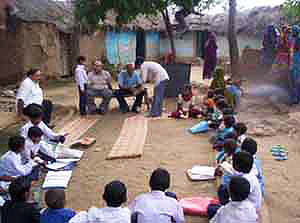 On August 21st and 22nd 2007, EVFI president - Sri Vijay Maroo, present trustee and ex-president -Sri Satyendra Prakash and an executive committee member - Dr. Harish Anand visited 9 Ekal Vidyalayas in remote villages around 60 kms far from Gwalior anchal of Madhya Pradesh. 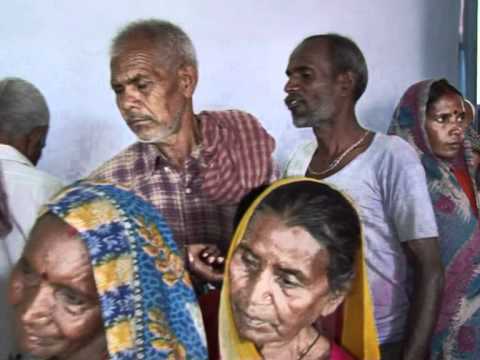 The villages were in a radius of about 20 kms from Dabra. This visit was particularly taken to review the functioning of these schools keeping in mind the quality aspects and other standards as per our norms. Though all schools could not be categorized as of grade 'A' however it was a satisfactory experience. The village committee members also came forward to express their opinions on our schools. 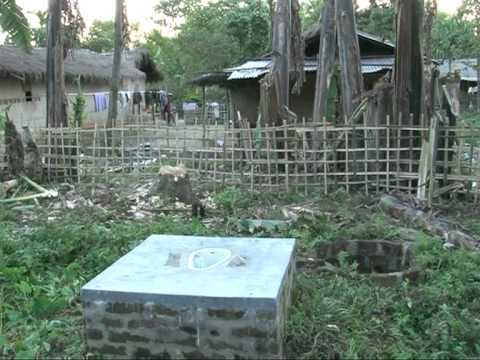 In one particular village, though there was a Government run school very close by, the local village committee insisted that the Ekal School must continue as their children were getting better overall education here. The two EVFI officials also got the opportunity to attend the training camp which was attended by Upsanch Pramukh and others.